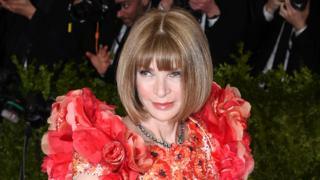 Vogue's editor-in-chief Anna Wintour is the most powerful woman in media and entertainment, according to Forbes magazine. Dame Anna has earned a reputation as one of fashion's most influential, and formidable, commentators. The famous fashion boss is also the artistic director of Vogue's publisher Conde Nast. She is joined on the prestigious list by the likes of Beyonce, Taylor Swift and JK Rowling. Forbes compiles the annual list based on money earned, media mentions and general influence. But why is Dame Anna top of the tree? Media analyst Alice Enders has a theory. "It's pretty simple why Anna Wintour is number one - Facebook's Sheryl Sandberg and Google's Susan Wojcicki are not included in that list," she says. "By media, they mean the printed press and performing arts. "They (Forbes) have studiously segmented out the advertising genius of Facebook and Google, despite these two companies being advertising behemoths today." Despite that, Wintour has still squeezed out other big names including Bonnie Hammer (number two), the chair of media company NBCUniversal. "Anna Wintour is the most influential woman in the printed press simply because Vogue magazine is the pinnacle of taste-making and women's fashion," Enders explains. "She incarnates the transatlantic bonds of commercial fashion endeavour today, spanning the continent where fashion was born to the dynamic innovation of the British and American fashion houses." Forbes rich list: Which celebrities earned the most over the past year?